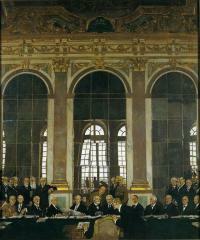 In January 1919 leaders of the Allied nations gather in France to write the peace treaty. The Treaty says that Germany was to blame for starting the war so will have to pay compensation to the other countries that were affected. Germany also has to give up some areas of land and a limit is placed on the size of her military. Although Germany thinks the terms are unfair, the Treaty of Versailles is signed on 28 June 1919, exactly 5 years after the assassination of Archduke Franz Ferdinand. Prime Minister David Lloyd George represented Great Britain at the conference. As part of the terms of the Treaty, Germany paid reparations (money for the damage caused by the war) in coal to countries like France. This has a severe impact on Welsh coal exports.